I've been uploading selections of my writing to Scribd, a document-sharing site that resembles a YouTube for texts. Click on my Scribd badge to access my documents -- a mix of fiction, essays, and reviews. 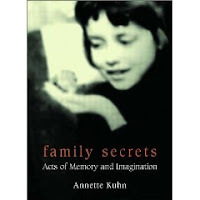 The most popular entry I've posted on VirtualDayz since I started this blog in 2005 has been a commentary on Family Secrets: Acts of Memory and Imagination, a memoir by British film scholar Annette Kuhn. Four years later, it's still attracting readers from around the world. The text receives at least a few hits almost daily, mainly through Google searches.